A few months have passed since my last (and first) Le Tote review post and a lot of you (ok, maybe two of you) told me you'd like to keep seeing what I get in my Le Tote boxes, so I'm here to update you on my last two boxes. As I explained before, Le Tote is a personal styling service that sends you 5 item that you keep and wear as many times as you want, then ship back for a new box of 5 items. The cost is $59/month, shipping is free both ways and there's no limit on how many boxes you get in a month. As opposed to Stitch Fix (where they choose all 5 items for you), Le Tote lets you pick your items from a virtual closet and swap out items before they ship, giving you more control over what you receive. Each box contains 3 clothing items and 2 accessory items. If you love anything, you can keep/purchase it for a discount. My March Le Tote box contained 1 sweater, 2 jackets, a scarf and a necklace. Two of these items were in my Le Tote "closet" and selected based on my picks and 3 of them were chosen for me, although I ended up swapping out a dress they chose for an additional jacket and replaced a bracelet with a necklace. One of the things I like about this service is that you have 48 hours to swap out other items for the pieces they send you and can make your choices based on what events and occasions you have coming up. I realized from my past boxes that I got a lot of use out of the jackets and sweaters and less use out of the jewelry and handbag accessories, so I chose those items. Plus, it was still pretty cool here in March, so I liked being able to choose warmer items. 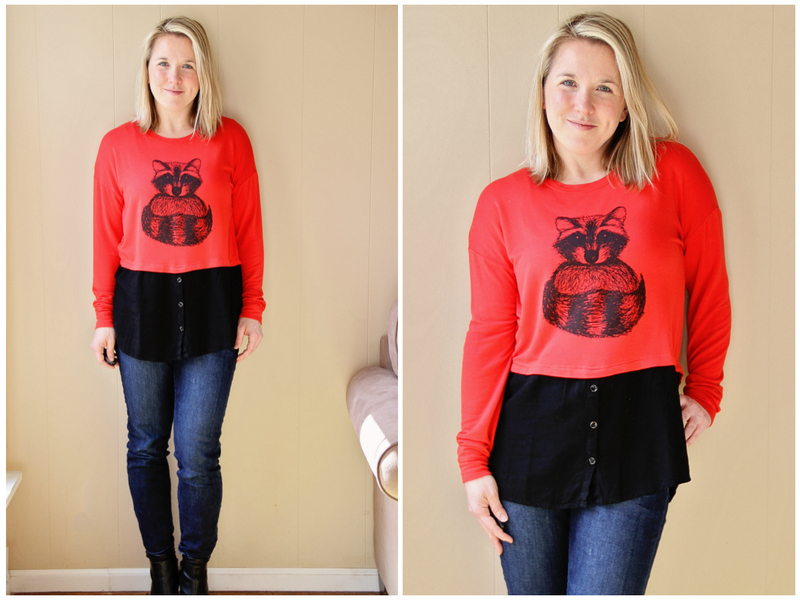 Kensie Raccoon Contrast Top - I liked this sweater and thought it was cute. Not something I think I'd get a ton of use out of, but it was comfortable, casual and I loved the red. The mixed materials were a bit strange with the buttons in the front on the bottom half, but I thought it was cute and got a lot of compliments on it when I wore it out. Octavia Textured Woven Jacket - This jacket was great for work, but was just a tad bit off on sizing. The sleeves were a bit long and the jacket was really tight through the shoulders and bust. Plus, it was very short. I wore it a couple times, but not something I wanted to keep. Tart Vegan Leather Bomber Jacket - I had high hopes for this jacket, but in reality I didn't love it as much as I hoped. It was really comfortable and soft, but looking at the photos, I think it looked a bit cheap. I also didn't love the gathered waist and felt like it was a bit too 80's for my taste. Camilla Watercolor Scarf - This was such a pretty scarf and I actually got a ton of use out of it. The colors were bright and pretty, without being overpowering. It went with everything (black, brown, blue, pink, yellow, white, navy) and was really soft. Loved it. 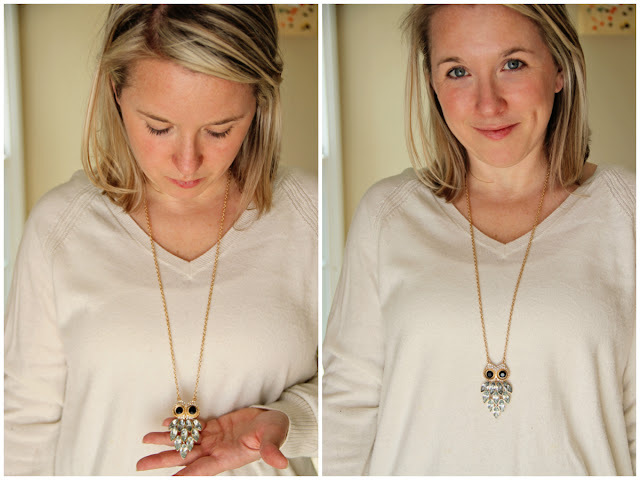 Camilla Owl Pendant - I only wore this once, but it was a cute little owl necklace that Mim loved! I chose this because my grandmother loved owls and it reminded me of her, but I didn't get much use out of it. Overall, the March box was ok. Not my favorite, but a couple good pieces. My April Le Tote box was much more colorful and spring-appropriate. In this box I received one peplum top, one sweater, one dress and two scarves. Three of the items were from my "closet" and two were chosen for me. Again, I switched out a couple items that were chosen for me with a few items I wanted based on what I had going on in April. French Connection Woven Peplum - Although a bit wrinkled in the photo (my fault), I really liked this peplum top. It's v-neck (which I love) and definitely did a good job hiding my mom-belly. 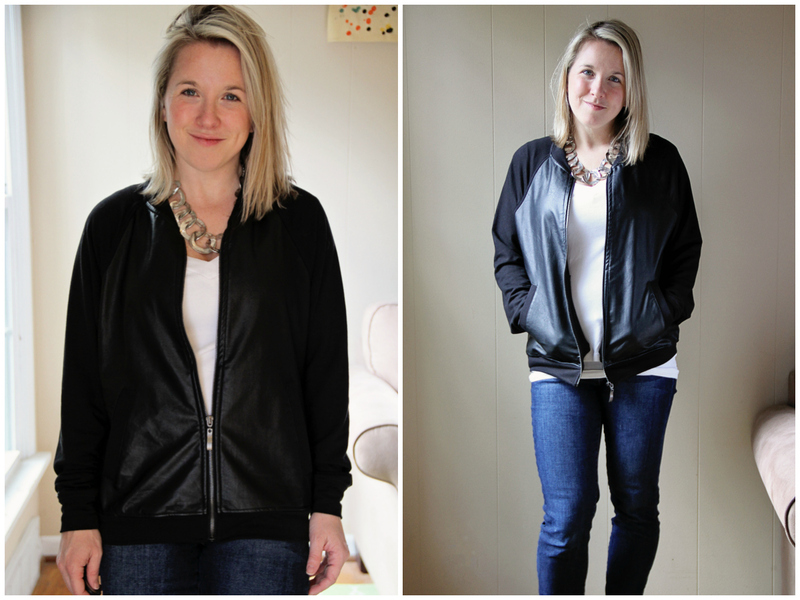 I'm not a big fan of anything without sleeves, but this was perfect for layering under a cardigan or jacket. 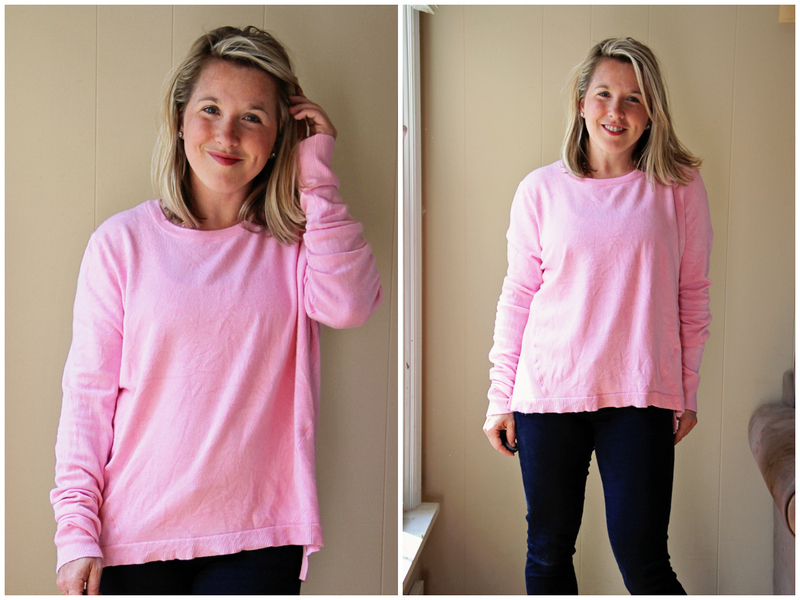 French Connection Crewneck Pullover - While not super flattering or anything special, I really liked this pink sweater. I don't have many pink clothing items in my closet at home (I'm a neutrals kind of girl), so this was a nice pop of cotton candy color. It was also really really soft and amazingly comfortable. I could live in this sweater. Camilla Orange Graffiti Scarf - This little orange scarf was so pretty, but it was a total mess of static cling, even after spraying profusely with Static Guard and rubbing down with a dryer sheet. It stuck so badly to itself that I could barely style it for a photo. I wore it once for just a few hours and couldn't stand it sticking to me and itself, so this was a fail. Ava Citron Stripe Scarf - By contrast, this scarf was so pretty and really soft, although I'm not sure it photographs as well. I love the neutral colors and it went with practically everything I owned. 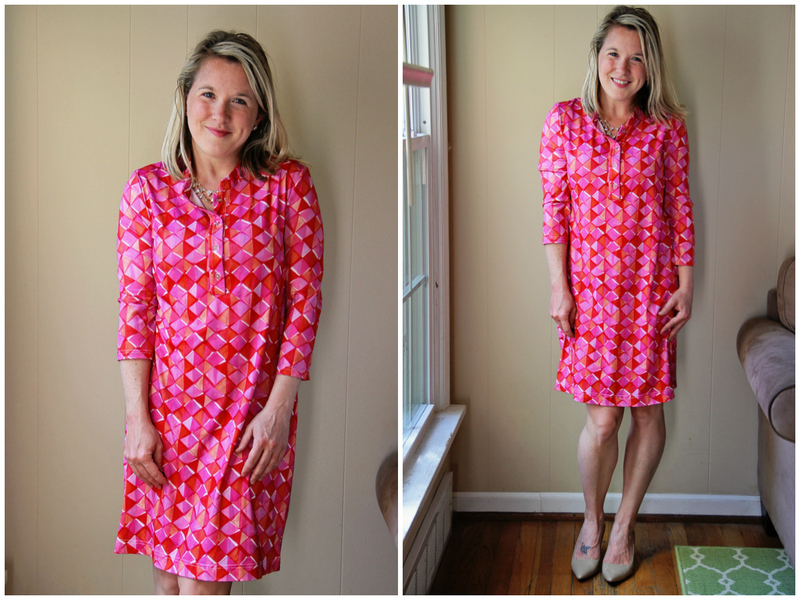 Ava Camilla Jersey Shift Dress - I immediately discarded this dress when I pulled it out of the box and it took me forever to even try it on, but I'm glad I did because it looked so much cuter on than it did on the hanger. Bright, colorful, fun and flattering. Plus, super light and comfortable. This would be a great piece for summer in the office...I might ask for it again. Overall, I was really happy with my April box. I ended up keeping it weeks longer than I expected to because I just wasn't ready to send the pieces back. But now I'm getting excited to see what's going to be in my next tote! And if you want to try Le Tote, I'm giving away a free month of the styling service! Just use the Rafflecopter below to enter! Good luck! Has anyone else tried Le Tote? Which item above was your favorite? You should wear more pink. You look so good in pink. (But you look good in everything). I love the last dress on you. 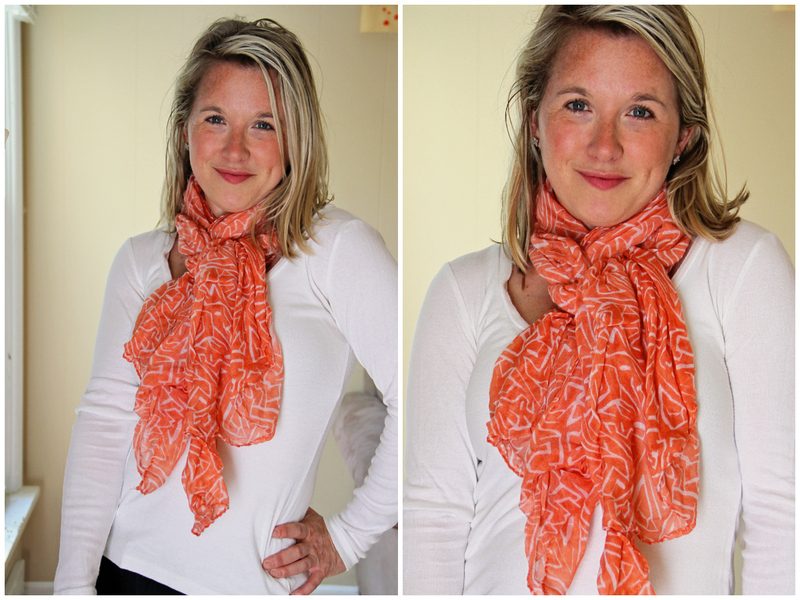 It's fun and bold (no neutrals there) and looks really great on you. I also like the accessories that you received. Too bad the orange scarf was so clingy, I love the color. All of your stuff is so fun and cute! You look great in everything! Good thing I'm not your stylist otherwise your credit card bill would be huge! I have been dying to try it, that means I would have to wear more than my mommy clothes and scrubs! I used to get these boxes! I love what you got to try! 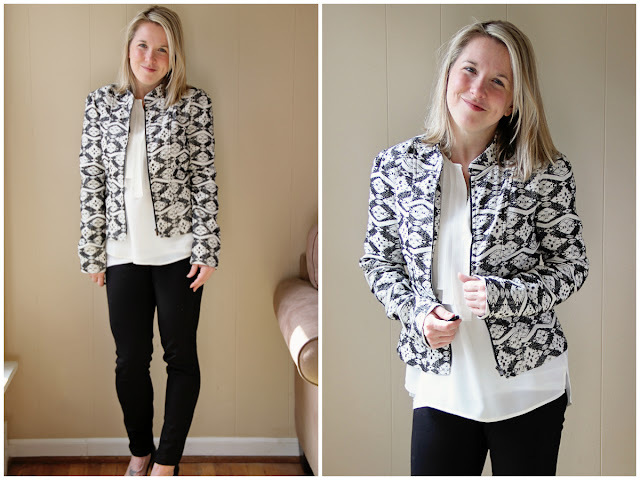 I love that woven jacket from your March box! I bet if the sizing was right it would be a perfect piece! And all three of those scarves are gorgeous! What?! This is the coolest idea ever! And I agree with everyone above that said you look great in pink! That last dress looked GREAT on you! Super flattering! You are the cutest ever! How do you take such great photos of yourself?? I seriously think you look fab in everything and I can't even pick a favorite! I love those scarves! If a box full of scarves arrived at my door I would be SO happy. You are totally rocking that raccoon top! I love it! I love the black and white scarf and the pink dress! Although I really wish your clear colored cup was included in these pictures like when you pack on snap chat. Cause those are my favorite! You are just the cutest! I love these posts. 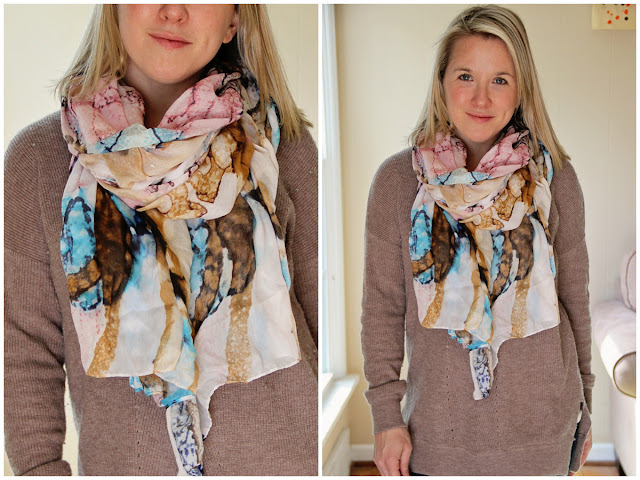 That watercolor scarf is beautiful! 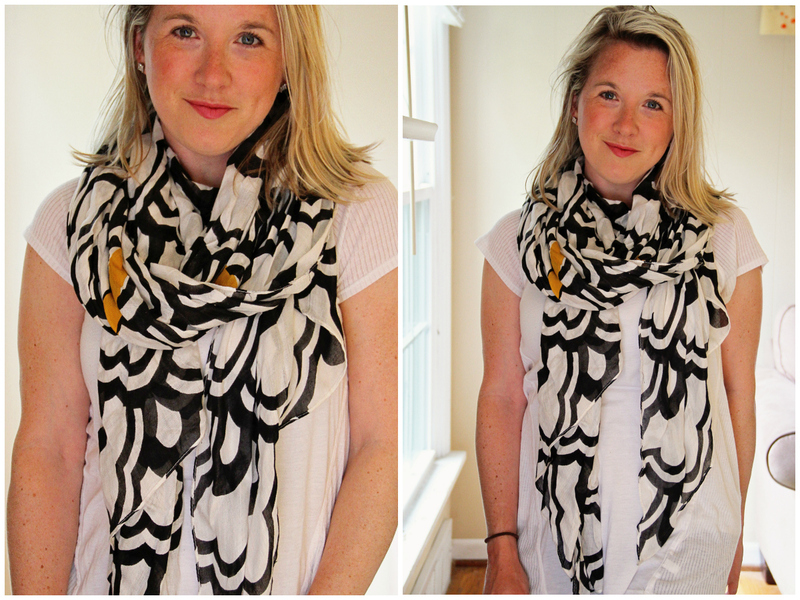 I really like that black and white scarf! Love the dress, out of my comfort zone, but looks amazing on you. Almost Lilly like with the colors. I love the two "soft" scarves and you look great in pink!!! I love this concept! Only problem is, I feel like I would become too attached to something to want to send it back. BUT actually odds are, I'd get sick of it or forget I had it or not wear it and want to send it back. I tend to wear the same thing over and over again anyway so maybe this would keep my rotation current! Another vote for pink colors on you - that sweater looks really comfortable! I love posts like these, especially since I am not at all fashion forward. The scarf is really pretty! I've never heard about this subscription box. I'll have to check it out! So fun! 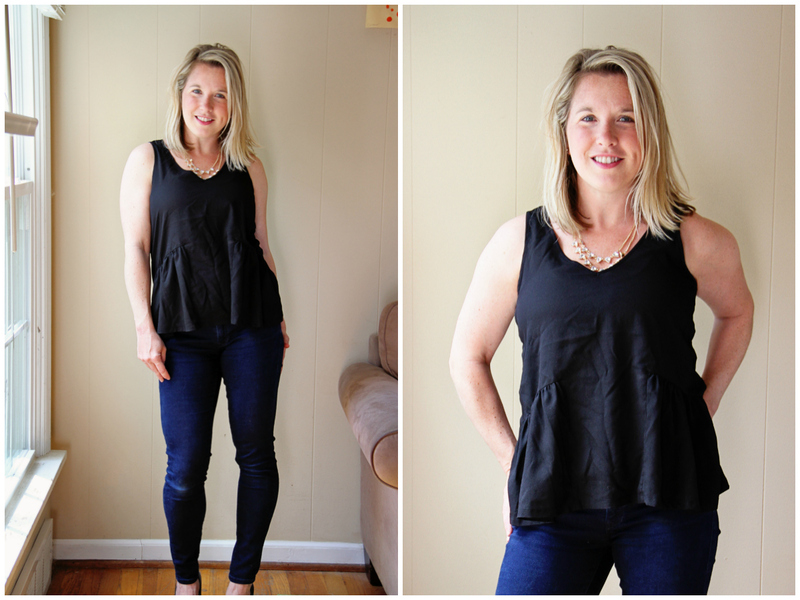 I love the Peplum top on you! So cute. The pink pullover looks so cozy and I love that shade of pink. And I think the pink patterned dress looks great on you!